JUVÉDERM VOLUMA™ XC injectable gel is the first and only filler FDA-approved to instantly add volume to the cheek area. It gives you a subtle lift, helping restore contour and a more youthful profile for up to 2 years. 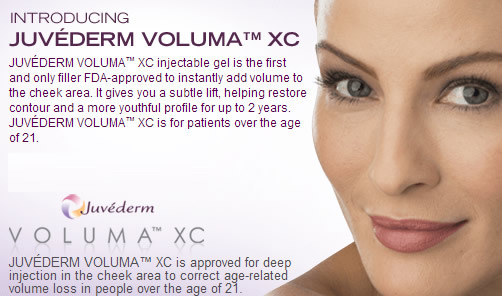 JUVÉDERM VOLUMA™ XC is for patients over the age of 21. We carry the complete Juvederm line including: the NEW Vollure, Volbella, Voluma, Juvederm Ultra, and Juvederm Ultra Plus. Juvéderm®XC Injectable Gel is a dermal filler that provides correction of moderate to severe facial wrinkles and lines. Dermal fillers are used to restore volume and fullness to the skin, giving a healthy and youthful appearance. Juvéderm®XC is especially useful for lines around the mouth and nose (parentheses lines) and for patients who wish to have richer, fuller lips.